The rise of antibiotic-resistant bacteria is a serious and growing threat to global health as multi-drug-resistant (MDR) bacteria causes millions of infections every year. A key threat is provided by biofilm infections of wounds and medical implants. In Rotello group, we have engineered gold nanoparticles (AuNPs) to design novel antimicrobial therapies, simultaneously we have generated multi-functional bactericides through self-assembly of engineered polymers/nanoparticles around an essential oil based core. Engineering NP surface can strongly regulate their ability to interact and penetrate bacterial cells with unique bacteriostatic and bactericidal mechanisms. In a recent study, we have demonstrated that hydrophobic functionalized gold nanoparticles can effectively combat MDR clinical isolates. Moreover, these engineered NPs can also be used as efflux-pump inhibitors to exhibit synergistic activity with antibiotics against resistant species. We have explored the role of core size and charge orientation to regulate the antimicrobial activity of zwitterionic nanoparticles. Furthermore, we have used pH responsive nanozymes to image biofilm-associated infections. Figure 1. Illustrating nanoparticle-drug synergy against MDR bacteria (left) and pH-responsive nanozymes to target biofilms (right). 1) Li, X.; Robinson, S. M.; Gupta, A.; Saha, K.; Jiang, Z.; Moyano, D. F.; Sahar, A.; Riley, M. A.; Rotello, V. M. “Functional Gold Nanoparticles as Potent Antimicrobial Agents against Multi-Drug-Resistant Bacteria” ACS Nano., 2014, 8, 10682-10686. 2) Huo, S.; Jiang, Y.; Gupta, A.; Jiang, Z.; Landis, R. F.; Hou, S.; Liang, X.-J. ; Rotello, V. M. “Fully Zwitterionic Nanoparticle Antimicrobial Agents through Tuning of Core Size and Ligand Structure” ACS Nano., 2016, 10, 8732–8737..
3) Gupta, A.; Saleh, N. M.; Das, R.; Landis, R. F.; Bigdeli, A.; Motamedchaboki, K.; Campos, A. R.; Pomeroy, K.; Mahmoudi, M.; Rotello, V. M. “Synergistic Antimicrobial Therapy using Nanoparticles and Antibiotics for the Treatment of Multidrug-Resistant Bacterial Infection” Nano Futures., 2017, 1, 015004..
4) Gupta, A.; Das,R. 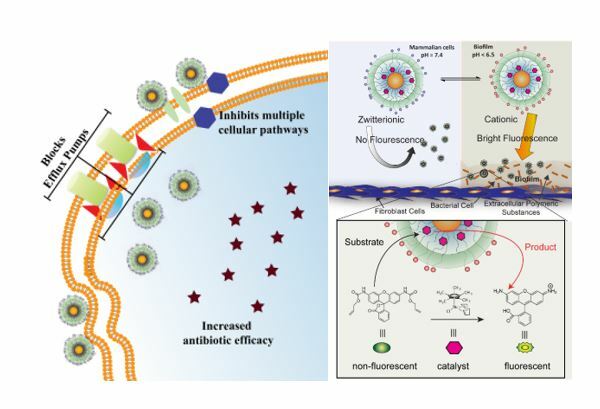 ; Yesilbag Tonga, G.; Mizuhara, T.; Rotello, V. M. “Charge-Switchable Nanozymes for Bioorthogonal Imaging of Biofilm-Associated Infections” ACS Nano., 2017, 12, 89-94. Localized delivery of the drugs/antimicrobials can increase their therapeutic efficacy. Engineering nanomaterials provides a potential platform to tune molecular interactions with bacteria. Therefore, nanomaterials can serve as promising drug delivery vehicles owing to their tunable surface functionality, biocompatibility, and high drug loading capacity. Rotello group has fabricated multifunctional bactericides through self-assembly of engineered polymers and nanoparticles around the essential-oil based cores to generate nanoparticle/polymer stabilized nanosponges. 1) Duncan, B.; Li, X.; Landis, R. F.; Kim, C. S.; Gupta, A.; Wang, L-S.; Ramanathan, R.; Tang, R.; Boerth, J. A.; Rotello V. M. “Nanoparticle-Stabilized Capsules for the Treatment of Bacterial Biofilms” ACS Nano., 2015, 9, 7775–7782 . 2) Landis, R. F.; Gupta, A.; Lee, Y.-W.; Wang, L.-S.; Golba, B.; Couillaud, B.; Ridolfo, R.; Das, R.; Rotello, V. M. “Cross-Linked Polymer-Stabilized Nanocomposites for the Treatment of Bacterial Biofilms” ACS Nano., 2017, 11, 946–952..